This solves hair problems such as damage, aging, and unwanted waves, with an amazingly simple process. Suppress means “control”. No relying on reducing agents or alkaline agents to reduce spread. No relying heavily on coating components, such as conditioners. Using only one item, a different approach and a surprisingly simple process can solve hair problems such as “spread”, “roughness”, and “no gloss” which cause “damage”, “aging” “unwanted waves”, etc. 【Before】 One problem is that frizz and damage create poufy hair. 【After】 Poufy hair is resolved, and becomes more manageable because gloss and elasticity are returned. 【Before】Another problem is hair that cannot be controlled due to dryness and waviness due to aging. 【After】 Elasticity and a glossy texture reappear, hair’s manageability increases. 1) Changing into easy to manage hair. SUPPRESS ACID has the effect of changing problems, such as “spread”, “roughness”, and “no gloss” due to “damage”, “aging” “unwanted waves”, etc. into manageable hair. When we measure the load carrying capacity of the hair, we find that hair treated with “SUPPRESS ACID” increases in strength. Strength increases even with chemical solution and blow-dry only treatment, but by adding heat from a hair iron, strength and sustainability are further enhanced. Traditional system treatments are usually not effective after one to three weeks. 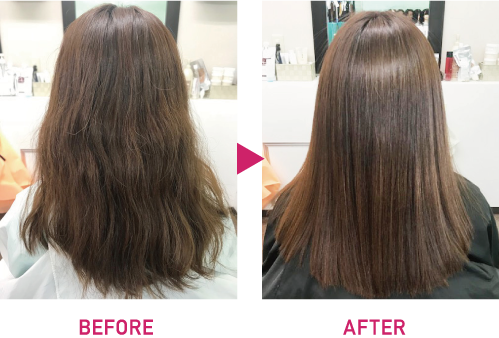 Many customers feel effects, such as “hair is stable”, “easy to control”, and “comfortable for styling in the morning”, and realize a persistence of this effect for one month to three months or more. Compared with a treatment or a straight perm using an iron, the same or less treatment time is possible. The treatment method can also be done simply with the conventional straight permanent technique. This is a type of acid which controls frizzy hair. Although the component mechanism is still unknown at present, it reduces wavy hair, swells and tangles, and its effects are highly sustainability, so it has received attention in recent years. This is the first oil-soluble keratin in the industry to change hydrolyzed keratin derived from wool into an oil. Hair strength and damage recover by supplying protein and fatty acids to damaged hair at the same time. This is a rapeseed oil origin component, which improves problem areas, such as unwanted waves and tangling, causing no stiffness but giving elasticity, and spreadability. Heating with a hairdryer or a hair iron causes reaction with the amino group in the hair, and the effect lasts after shampooing. The sugar content in maltose enhances finger styling and feel, while it coats hair surface and prevents damage from the heat of hair irons, etc. In addition, this sugar content protects the scalp from acid. Those who want to control and organize overly wavy and frizzy hair. Those who wants to control and organize poufy hair due to aging. Those who are worried about damage from straight perms. Those who are anxious about the sense that hair is overly-straight after a straight perm. Those who have thin, limp and lifeless hair, or show a flat finish after perming straight hair. Phylame is used mainly for dry parts such as the tips of hair with excessive damage, etc. Apply it to hair tips mainly, then with hot water in a shampoo bowl, let the hair spread totally with the change rinse. Apply appropriate quantities of SUPPRESS ACID. Please spread completely throughout using a comb. / Please be moderate in combing the permanented parts. Warming for 15 to 20 minutes as a guideline. When using wet heat wrapping is not necessary. When using dry heat, wrap to prevent dryness. If the waves are strong, please heat longer (20 to 30 minutes). Plain rinse~ Shampoo after making a slight lather. When hair is washed lightly, odor rarely occurs so a slight lathering of shampoo is recommended. Washing by the change rinse processing after mainly applying prime treatment to the tip of the hair. Blow-drying while applying tension using finger combing and a brush. At this point, please inform the customer once about the finish. Slice width should be 1 cm as a guide. If the wavy hair is strong, thinner slices are recommended. ※When hair is cut, please use a treatment after pre-shampooing in Step 1 or before drying in Step 7. ※When shampooing at home on the day of treatment, please wait for more than 6 hours before shampooing. Is pre-shampoo necessary? Additionally, is it possible to apply it in a dry condition? In order to accelerate penetration of SUPPRESS ACID, pre-shampoo is recommended. Do I need to shampoo after washing mid-treatment? When hair is washed lightly, odor rarely occurs so a slight lathering shampoo is recommended. Is there recommended care at home? After shampooing, apply ceno LAMELA EMULSION Light Repair (light finish) or PHY APPLI Prime Treatment (slightly deep finish), and dry completely using hand combing or a brush. Depending on hair quality, in cases where SUPPRESS ACID is applied we find the effects lasting from 1 to 2 months. Can I mix it with other medicinal solutions (permanent and coloring agents)? This is a low pH medicinal solution so that mixing is extremely dangerous depending on the mixed medicinal solution. Also, when mixing it with a perm wave agent or coloring agent, the pH of the medicinal solution may decrease, so do not mix it. □Those who have strong, unruly hair. □Those who want to straighten unwanted curls or waves completely. □Those who want to create flat hair roots. □Those who want to straighten the hair tips firmly. □Those who want to permanent their hair. □Please wear gloves to prevent damage to hands or fingers from penetration. □Please protect customer’s ears with ear caps, etc. □Instruct customers to refrain from shampooing at home for 5 hours after using SUPPRESS ACID treatment. □Do not mix with other medicinal solutions such as bleaching agents, hair-coloring agents, perming agents etc. □Be sure to follow the instructions carefully. □Please inform the customer once about the hair finish before ironing. Customers may not be able to produce the same gloss and feel as the professional in the salon after shampooing at home by themselves. When medicinal solution remains at the time of intermediate washing,　a strong odor when hair is wet after treatment. For this reason, in Step 5: Plain rinse~ Shampoo after lathering lightly. 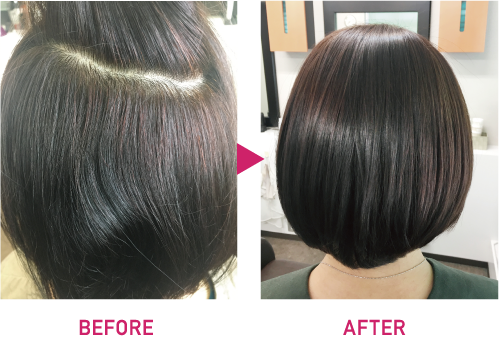 The finish loosens when using a hair iron after a permanent or using SUPPRESS ACID treatment on permanented hair too soon. When you want to suppress the volumizing effect on unpermed (uncurled) areas, please apply the iron only to the uncurled areas. It is also possible to finish by drying only the curled areas. □About treatment with hair color on the same day. Hair color treatment used shortly after SUPPRESS ACID shows a weakened feeling with less brightness and absorption of the dye. When lightening the hair color is desired, color treatment is recommended after an interval of about one week.